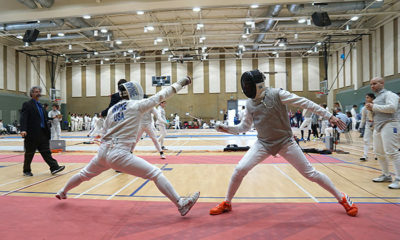 Graydon Schulze-Kalt (right, LAIFC) makes an attack against Julian Amico (UFA) in the Junior Men’s Foil event at the Junior Olympic Qualifier in Pasadena. 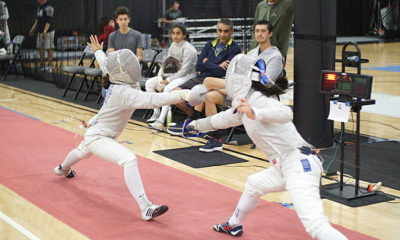 The Southern California Division’s annual Junior Olympic Qualifier was held at the Hutto-Patterson Gym on the campus of Pasadena City College on Sunday, December 2, 2018. 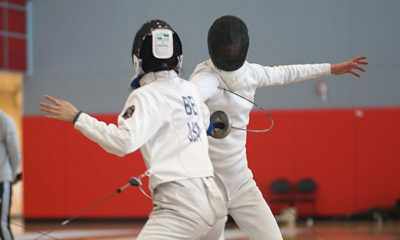 Junior (under 20) and Cadet (under 17) fencers who finished in the top 25% in their events qualify for the Junior Olympic Championships to be held in Denver, Colorado, February 15-18, 2019. 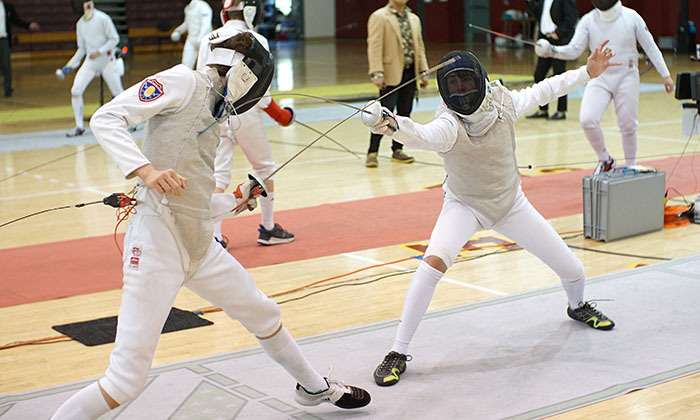 The Men’s Epee title at the 2018 Junior Olympic Championships was won by SoCal’s own Stephen Ewart. 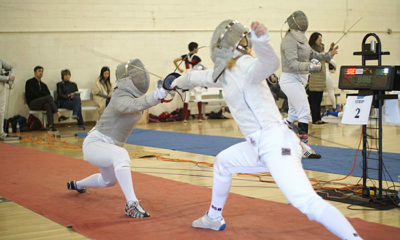 Congratulations to all our qualified fencers and good luck in Denver! Note: Several items were left in the gym after the tournament: 2 epees, 4 body cords, a mask cord, and a tool kit. Please contact Tigran Shaginian if you believe that any of these items may be yours. Qualified fencers are listed below. For complete results, see here.